We took the children to see The Meerkats last week. The filming itself is exceptional with very sharp close-up views. I kept wondering how they had managed to pull it off. On the other hand the soundtrack was pretty uninspiring, and the text, even though narrated by Paul Newman, is without merit. We’re a long way from Richard Attenborough’s Life on Earth. For instance, we learn that the litter from the previous year stays with their mother, and help teach and protect the offspring from the following year. But it’s only near the end of the film we learn that the father of Kolo (around whom the film revolves) is part of the group. But it’s never made clear if meerkats form a partnership for life, or if each litter is the result of opportunistic encounters. In a similar vein, basic genetics tells us that inbreeding within a small group will draw out lethal alleles rapidly and thus new members must come into the group, and other members must leave. 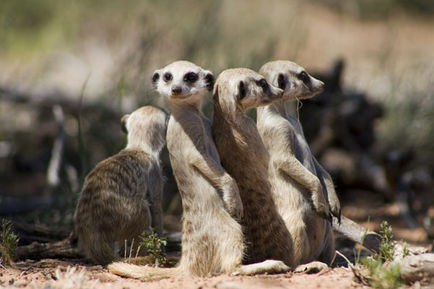 But just how meerkats solve this problem is never even hinted at. I received an e-mail link today asking me to take part in a survey “on the media”. Since I’m always willing to take advantage of an online survey to twist the answers to create a really odd datapoint in their database, I set about filling out the questions. Now I’ve seen Waltz with Bachir, which is a fantastic film, but it’s not something I’d take a six year along to see. In fact, I wouldn’t take them to see any of them, except perhaps for Wall-E and Kung-fu Panda. I was tempted to answer yes to a couple of them, or perhaps all of them, but it was too much; I answered none of the above. At that point the survey ended, so I’ll never know what they wanted to know, but I find it odd that there are people who would consider taking their young children to see such films.